Mystery Fruit slot appears to have been influenced by the quite popular (for reasons I cannot fathom) Joker Pro game from NetEnt. We have the same illuminated pixels background to the reels and simple basic icons in a stacked format, only the bonus differs slightly but has the same maximum potential. The volatility and pays are lower though due to the fact we get more paying lines here, so will the game be a case of a cherry on top of your balance or a rotten apple? There are 20 paying lines and as said the icons are stacked. It's funny I should mention 'Apple' as when this appears a number reel will spin inside it and then the Apple will expand vertically and/or horizontally for the number of positions that appear on it. These positions will then spin and end up on any icon which could pay a win on their own or link up to any symbols already there. So that's the Mystery Apple and we would hope that it produces some 7's as these pay best at 45x bet for a 5-of-a-kind win. Bells pay 27x, Melons 18x, Grapes 15.5x, Plums 9x. There are some odd values for our 20-coin stake in the lower icons with Oranges awarding 144 coins, Lemons 90 and the lowly Cherries 54 coins. There are no Wilds but a screen full of 7's would pay a considerable 900x stake or Bells 540x. Unlike Joker pro though we do get a dedicated bonus round which again is triggered with some weird and wonderful animations. All reels carry a stacked bonus overlay which makes an odd noise as it passes by to break up the repetitive beat music soundtrack we play to. Now these icons can also be exposed when the clumps of positions spin after the Mystery Apple has created its pattern on the grid, but more usually you'll just get them stop over the reels. You only need one in view to trigger the Wheel Bonus but the more the better as it awards a spin for each. The Wheel simply spins to award 2x to 10x stake prizes but at least one of the 10 positions will have extra spins of either 2 or 3. You may also see '+5 or +2 to all' for example which increases the awards on the Wheel for the remaining spin(s) or a '?' which can be any of the aforementioned awards. You can win 1000x bet here as a maximum but realistically you usually get a smaller prize of 3-20x bet . If you keep hitting 'extra spins' and '+5 to all' for example, you will then likely be getting one of the very large but rare results. Mystery Fruits slot is as bad as its brother Joker Pro for endless runs of dead spins and disappointing pays when wins do arrive. This is despite the 20 pay lines and supposedly lower volatility but then the RTP isn't great for this type of game at 95.22%. The Mystery Apple isn't too rare but again after 10 or 20 dead spins you'd expect a little better from it and I can't understand why the Wheel Bonus is so hard to trigger considering the abysmal pays and speed it usually passes in. 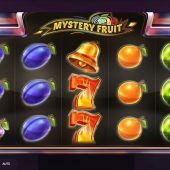 Mystery Fruits slot is clearly built around the rare and unusual large base game hits and once-in-a-while big feature results - without those you will suffer quickly! It's no mystery that there's one fruit not on the reels here which I definitely felt after playing this - a lemon.